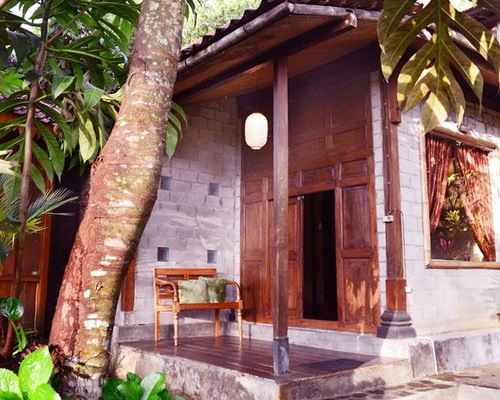 Tinuku ~ The Riverside Jogja Hotel presents stylish interior and exterior design Javanese luxury cottages. Hotel built on the slopes of Mount Merapi, Kaliurang, Yogyakarta, Indonesia, featuring stylish architectural design of classical culture in Javanese tradition. 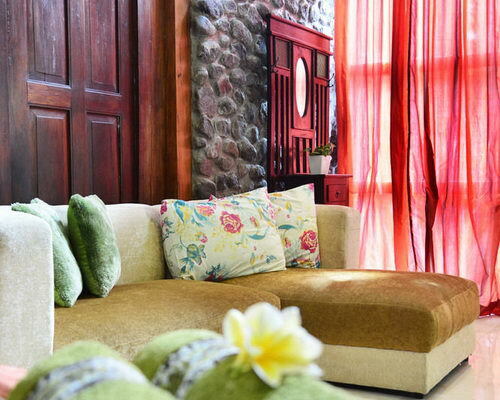 The Riverside Jogja Hotel offers touch of luxury in Kaliurang cool area spaces filled with natural shades wooden furniture and Javanese traditional touches. 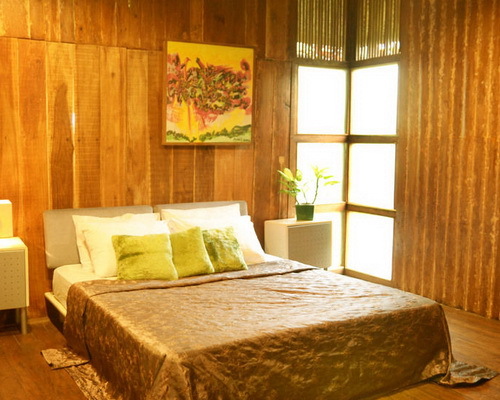 The concept of close to nature implemented in four cottage featuring living room, dining room and private kitchen. Lodges perched on mountain river flows wide and clear water with rocks and green vegetation lanskep right at the foot of Mount Merapi. 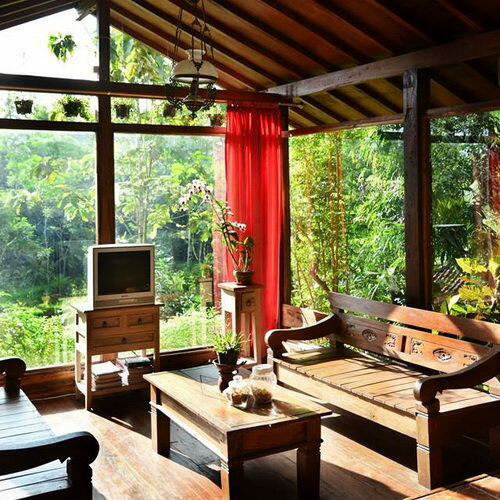 Without air conditioning, Javanese cabin design have wide windows that allow air circulation to fill any room. 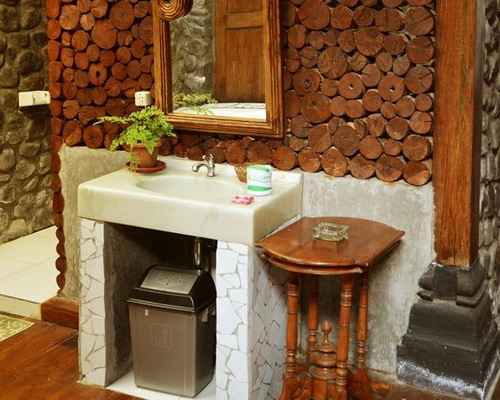 Applying natural stone wall material that deliberately expose the mountain stones as passive decoration. Bone walls and foundations using solid wood intact harvested directly from tree log. 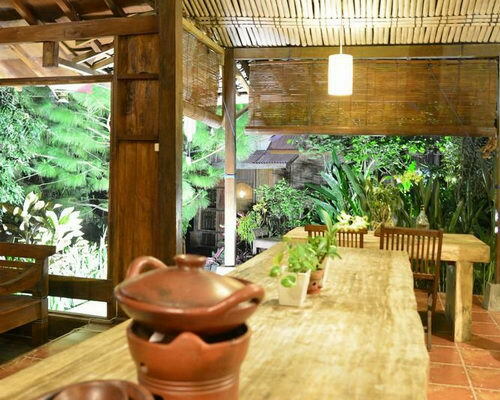 Restaurant implement Joglo architecture uses four large wooden pole is the distinctive design style of classical culture. 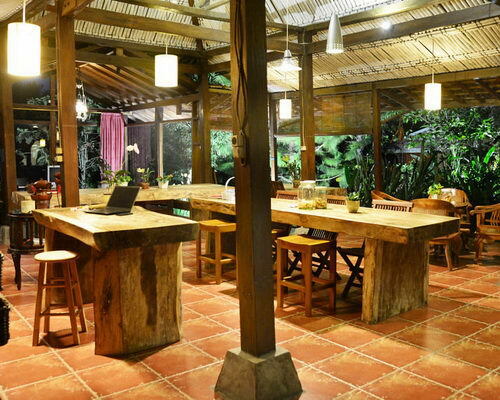 Long tables rectangular wooden teak trees are left intact without coating for deliberately showing natural tree fibers. 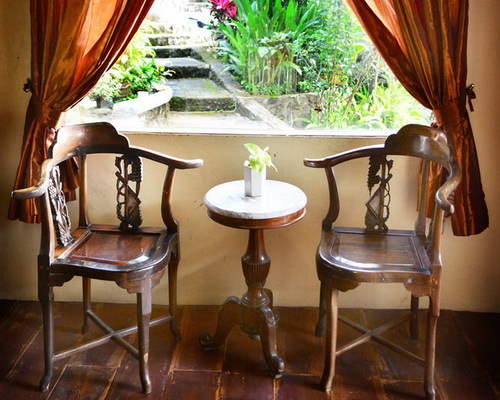 Design plain benches without armrests and lumbar support is typical in rural Indonesia. The floor tiles shaped rectangular boxes made of terracotta clay color displays become the foundation of classic design nuance. Tube-shaped hanging lamps mounted on the roof is made of split bamboo as a cover handmade clay tile can be found throughout rooms. Bamboo woven together using coconut tree fiber rope tied with tricky technique. The rooms have bath and hot water. The walls entirely using antique wood carvings or gebyok with many distinctive ethnic. Using curtain room divider made of thin fabric colorful so opaque to bring dramatic effect. Buildings surrounded by large trees, variety of tropical plants and fruits. Variety flowers in pots to fill all corners of the hotel complex is laid out as garden active accent. Banana trees were allowed to grow in the grass in the courtyard of the hotel. 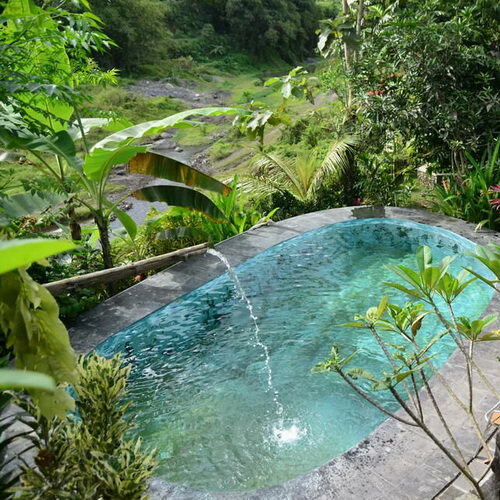 A medium-size swimming pool using mountain rock material is perched right on the river with beautiful panorama. The fountain uses made of bamboo pipes to supply water directly from the spring ground. Around the pool are frangipani trees, banana trees and coconut palms.